Apple on Wednesday emailed select customers that pre-ordered the Apple Watch to reassure them that the company is working on their orders and will provide them with specific delivery dates and tracking information when available. Apple appears to have sent the email to customers with Apple Watch pre-orders that have yet to be prepared for shipment ahead of Friday's launch. Apple Watch pre-order deliveries will begin on April 24 as scheduled, although it remains unknown how many devices will reach customers on day one. Apple confirmed earlier today that many Apple Watch pre-orders with extended shipping estimates will be delivered sooner than expected, but also noted that some customers with extended shipping estimates may still be in for a long wait. 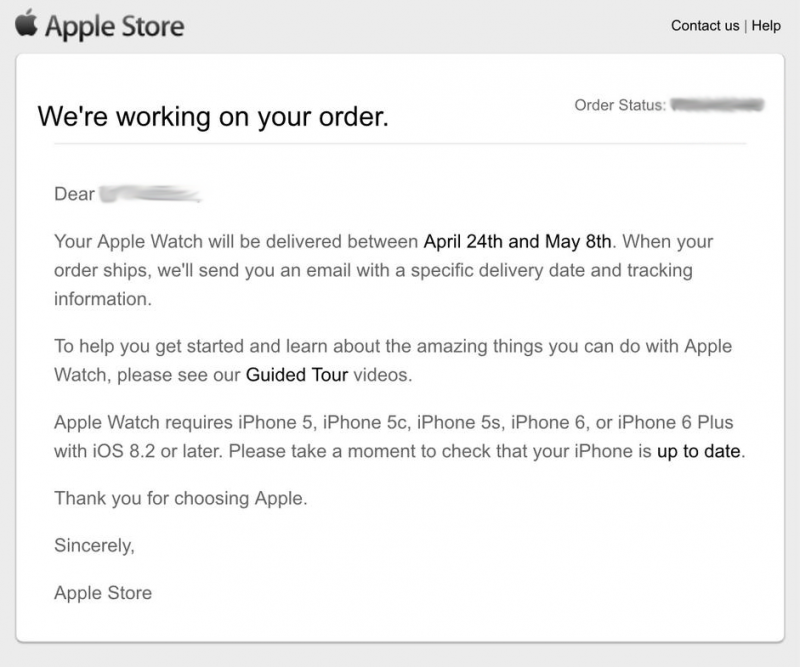 It is unclear if this email is intended to reassure customers that their Apple Watch pre-orders may still be delivered on April 24, or to acknowledge that the shipments will not be finalized in time for Friday but will still be delivered within the original April 24-May 8 estimated window. So what you're saying is that Apple is now promising to deliver my watch in the exact same time frame that they have been promising all along? Man am I angry about this. Oh no! They are going to deliver within the time they advertised when people placed their orders. Oh the horror! This launch seems very disorganized for Apple. Reassuring people? Yeah, I got this email...pretty much was a kick in the junk!! 1) People paid a lot of money for these devices. 2) There's always been a sense of pride in being an early adopter with Apple. Literally the only way to get (a chance) on launch day was online. Most of us checked out within seconds of the store opening. Part of Apple, whether you admit it or not is the Cool factor. The having it first factor. No one could camp outside of stores for this one. 3) People in later shipping windows, with the same SKUs, that ordered later --- ARE ALREADY GETTING THEIR SHIPPING INFORMATION AHEAD OF EARLIER PURCHASERS. Supply constraints are understandable. But please fulfill orders in the order they were received, not all caddywhompus golden ticket style. 4) Orders were placed 11 days ago. Besides the initial e-mail, and now this one, there has been no communication in regards to any delays. It shouldn't be that hard to get us an actual ship date at this point, unless the launch has been botched so badly, that they have no idea. Good god people you make it sound as if you won't be able to function if you don't have your watch on the 24th. How are you functioning now? This is by far the most misleading email of the 21st century. What is confusing and frustrating for people is that Apple doesn't seem to be fulfilling orders in the order in which the order was ordered. For example, I placed my order 90 seconds after midnight and I'm still stuck in "Processing". People who ordered the exact same model 5 minutes after me are being "Prepared for Shipment". Obviously, the supply is constrained which is understandable, but if Apple fulfills these watches out-of-order, people are going to be pissed.